Calum Stewart Naugher is 36 years old today, born in 1976. Calum's parents are Brent Stewart Naugher and Carol Annette Brown. Calum is Tara's 1/2 brother on their father's side. Calum married Deanna Hudson April 12, 1993 and they begot Christopher Stewart Naugher in 1993 and Jordan Kyle Naugher in 2000. Chris and Jordan are Tara's Nephews. HAPPY BIRTHDAY CALUM!!!!!!! Amanda A. Stewart is 160 years old today, born in 1852. Amanda is Chris and Jordan's (the boys') 4th great-grandaunt, the sister of Frances Matilda Stewart who married Frances Marion Savage in 1860 and begot 17 Savage children. The 3rd born was named Amanda by Amanda A. Stewart's sister Frances. Amanda E. Savage died 147 years old today at 3 months old in 1865, in Cherokee county, AL. Amanda was born on Oct 10, 1864 in AL to Frances Marion Savage and Frances Matilda Stewart. This is where the middle names, Stewart and Savage come from in the Naugher family. Frances Marion was born in Union, AK in 1836 and Frances Matilda was born in GA in 1845. Together they had 17, yes 17 children. This is a single family record for all of our families. They were married on Oct 4, 1860 in Calhoun, AL. They had their first, Sallie E. Savage, the boys' 3rd great-grandmother on Oct 30, 1861 in AL. Susannah in 1863, Amanda in 1864, James Thomas in 1866, John R. in 1868, Samuel Davis in 1869, William Benjamin in 1871, Lott Walker in 1872, Frances M. in 1874, Joseph D. in 1876, Josephine V. in 1877, Charles Alfred in 1879, Paul Heflin in 1880, Henry C. in 1881, Raleigh Haynes in 1883, Infant in 1885, and the baby, Rufus Webster Savage in 1886. That's 17 children in 25 years!! This must have been very hard because many of these kids died young. Sally the first died at age 39 in 1901, Susannah E. died just 3 months old, Amanda E. just under 3 months, James Thomas lived to be 67, John R. died at age 5, Samuel Davis lived until he was 58, William Benjamin just 46, Lott Walker got to see 85, Frances M. just 24, Joseph D. just under 1 year, Josephine V. only lived until she was 7, Charles Alfred was 75, Paul Heflin was 64, Henry C. lived from July 18 until Nov 6th, just over 4 months, Raleigh Haynes was 69, Infant was still born, and Rufus Webster only lived until he was 56. Sallie E. Savage, the oldest, married Mose Service Naugher on Aug 3rd 1883. They had 7 children, the 6th one is the boys 2nd great-grandfather, Horace Savage Naugher, on July 22, 1897. Horace married Maxie Ruth Smith and begot 9 children. Their oldest was Moses S. Naugher born on September 17th, 1920. this Moses married Haney Fortenberry on March 16th, 1946 and begot their middle child of 3, Brent Stewart Naugher on Feb 3, 1952. Frances L. Naugher died 81 years ago today in 1931 at age 74 in Cherokee, Alabama Frances is the boys' 3rd great-grandaunt. Her brother was the Moses Service Naugher born in 1851 that we just talked about. Their parents are Robert Marion Naugher from Union, AK and Mary Ann Reedy from SC. Robert and Mary were married on November 4th 1847 in Benton, Lowndes, AL. and are the boys' 4th great-grandparents. Authur Samuel Kenley is 152 years old today, born in 1860 Authur Samuel Kenley, the boys' 1st cousin 5 times removed was born on this day in 1860. Authur was the oldest of 4 children of the boys' 4th Great-granduncle Franklin Kenley and his wife Eliza J. Bowman from IN. Franklin was the only child (I know of) of John Kenley and his second wife Zilphia Nevins. John and his first wife Mary Warmsley are the boys' 5th great-grandparents. Together they bore James S. Kenley, their 4th of 7 children and the boys' 4th Great-grandfather born in Kentucky in 1813. James married Mary Jane Gill on March 19th, 1835 in Orange, Indiana. This is the couple who bore two of David Stanford's wives, Amanda Jane Kenley (1840-1863) and her little sister Nancy Ann Kenley (1844-1888), the mother of the boys' Great, great-grandmother, Margaret Jennie Stanford who married Joseph R. Wooden and begot Walter William Wooden Sr.
Benjamin Sells died 119 years ago today in 1893 at age 61 in Iowa. Ben is the boys' 1st cousin 5 times removed. His mother is Sarah Le Fevre, the boys' 4th great-grandaunt. and sister of Mary Magdelaine Le Fever, the boys 4th great-grandmother who married James Johnson March 4, 1824 in Salem, Indiana. James and Mary begot Amanda Johnson in 1833 who married Andrew J. Wooden November 24, 1858 in Owen, IN. Ceasar Alford Steible and Lola Ray Everhart's 84 anniversary is today, married in 1928 when he was 19 and she was 21 years old. Al and Lola are the parents of Betty L. Steible who married Jerry J. Wooden, Sr in 1950 and begot the 4 Wooden boys, Jerry Jr., Steven, James and Walter. Al and Lola are also Steve, Jr's great-grandparents. Lillian Ruth "Ruthy" Everhart died 27 years ago today in 1985 at age 73 in Los Angeles, California. Lillian is Steve's great-grandaunt, the sister of his great-grandfather, Al Steible. Lillian married Charles Reiff and begot Rodney Allen Reiff in 1945. Rodney is Steve's 1st cousin twice removed. Cecil Raymond Everhart is 92 years old today, born in 1920. Cecil is Steve's 1st cousin 3 times removed. His father is James Noel "Smokey" Everhart, the brother of Steve's 2nd great-grandfather, Elmer Elsworth Everhart. Charlotte Brown died 146 years ago today in 1866, 10 days after giving birth to Lottie B. Ray on Christmas day. Charlotte was 26 years old. Lottie married Samuel Hazelitt Cotton in Appleton City, MO December 13, 1887. They had 3 children, Hubbard Ray Cotton 1890, Marie Antoinette Cotton 1891 and Helen Mar Cotton in 1898. Phebe Lay is 361 years old today, born in 1651. Phebe's mother is 10th great-grandaunt, Sarah Fenner, the sister of Phoebe Fenner who married William Ward in Middletown, CT March 28, 1660 and later begot Phoebe Ward in 1663 the mother of 8th great-grandmother Experience Hall and 8th great-grandaunt Phebe Hall. That is a lot of Phoebes no matter how they are spelled. The aforementioned Phoebe Fenner is 379 years old today, born in 1633 Phoebe is the boys' 10th great-grandmother, Phoebe Fenner. A side bar to note is that this was just 1 year after the Connecticut charter was granted by the crown, see http://www.usahistory.info/New-England/Connecticut.html . Phoebe lived to be 58 and died on Sept 1, 1691, in Middletown. Phoebe was the second wife of William Ward of Northly, Oxfordshire, England. William's first wife Sarah Phelps, who he married on Jun 9th 1658 in Windsor, CT, seems to have died from a difficult child birth. She gave birth to William Ward Jr. on June 21 1659 in Middletown. She died three weeks later on July 9th 1659. Unfortunately, William Jr. only lived two years, dieing one day short of his 2nd birthday in 1661. William having been left with a sickly child (seemingly), married our grandmother Phoebe Fenner on March 28th 1660 in Middletown. Phoebe got pregnant quickly there after and gave birth to her first of 9 children Thomas Ward in Feb of 1661. Now with a child of her own and a sick step child she nursed William Jr. until he died in June of that same year. Her second child and name sake, Phoebe Ward was born April 17th, 1663 in Middletown. Phoebe Jr. married Samuel Hall on Dec 6th 1683 in Middletown and a year later they begot my favorite family named child, Experience Hall on Feb 21, 1684 also in Middletown (Steve says her name sounds like a building for call girls) . Experience married Samuel Cotton from Concord Massachusetts on Feb 28, 1716 in Middletown. They begot William Cotton, their second child of 9 in 1720. William married Rebeckah Ward on Sep 22, 1742 in Middletown and their last child was Thomas Cotton, the boys' 6th great-grandfather born in the midst of the American Revolution in March of 1764 in Middletown, Middlesex, Connecticut. Thomas was born around the time of the French and Indian War. Cora Augusta Edge is 110 years old today, born in 1902. She is the mother of 11 children, including the kids' Great-grandfather Roland Max Myer, with her husband Dedrich Homer Myer. 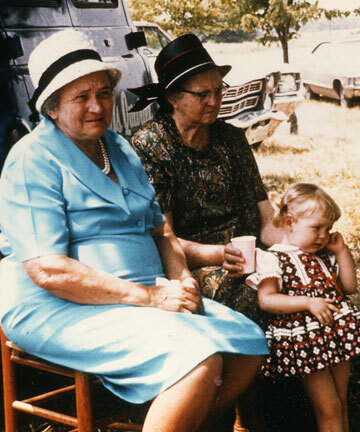 Cora lived 82 years and died on Aug 7th, 1984 in Centre, Cherokee Co., AL. I've heard many stories about Cora and her long, long hair she kept in a bun, from different family members, but nothing I remember well enough to put down in writing except that, Darlene talks about all the great visits she had to her Grandmother's house in the summers. Darlene said that Cora didn't talk much but what she did say was very important to listen to. Darlene remembers, picking cotton and tomatoes in the fields in her bare feet, feeling the cool soft dirt between her toes. The girls would climb the big tree beside the pump house and accompany their Grandmother down into the smoke house and root cellar to get food for the meals. They also tell stories about Cora drying apples in the sun to make the best apple pie they've ever had. Elizabeth Barnett died 144 years ago today in 1868 at age 61 in Madison, Georgia and is buried in the Pittman Family Cemetery near Sanford, Madison, Georgia. Elizabeth is the kids' 1st cousin 7 times removed and the wife of the kids' 5th great-granduncle, William H. "Goober" Barnett, the brother of Abel M. Barnett, the kids' 5th great-grandfather. Martha A. "Mat" Starling is 146 years old today, born in 1866. Mat is the kids' 3rd great-grandaunt, the sister of Alice Cora Starling, who was the 11th born and the last to William B. "Wiley" Starling and Augusta Ann Powers, the kids' 4th great-grandparents. Rachel Meadows is 199 years old today, born in 1813. Rachel is the kids' 5th great-grandmother. She married Abel M. Barnett January 11, 1832 in Oglethorpe Georgia and begot 9 children with David A. Barnett, the kids' 4th great-grandfather being the first born in 1833. Hoyt McMurrey and Mosseleen Milam's 93rd anniversary is today, married in 1919 when he was 18 in Cherokee, Alabama. Hoyt is the kids' 3rd great-granduncle, the brother of Ida Jane McMurrey born to William M. McMurrey and Lucy Ann Kelley, the kids' 4th great-grandparents.